The last time an astrobiology mission landed on Mars, the nation was celebrating the Bicentennial and Gerald Ford was president. NASA's two Viking landers went with the specific mission to search for signs or examples of Martian life — a task that produced generally negative results, but also decades of controversy and public confusion about the possibilities for life on the planet in our solar system most like ours. NASA's Curiosity rover will land on Mars Sunday night (Aug. 5) to begin what is once again an American astrobiology mission. By design it won’t involve life-detection — it has neither the tools nor the level of sterilization needed for that — but it was assembled to look for the carbon-based building blocks of Martian life and to explore the possible habitats where life might once have existed. Color coding in this image of Gale Crater on Mars represents differences in elevation, with blue relatively low and tan relatively high. The vertical difference from a low point inside the landing ellipse for NASA's Mars Science Laboratory to a high point on the mountain inside the crater is about 3 miles (5 kilometers). But what most differentiates Curiosity from Viking is probably its landing site: The deep and ancient Gale Crater, which was made accessible to the rover because of vastly improved precision landing techniques. Orbiting satellite imaging has already determined that the crater was covered with water in the past, and that it contains minerals that can only be formed in water. What’s more, Curiosity can move around to promising targets and can drill and then bake samples as never before. In other words, the rover will be exploring an area far more likely to contain the building blocks of life than any of the six Mars surface explorers that came before it. The principal investigator for SAM is Paul Mahaffy of the Goddard Spaceflight Center, who has worked to put together the instrument for more than eight years. He and other NASA scientists are quick to explain that finding organics on Mars will be very hard to do, and that it’s difficult to find organic carbon in rock samples even on Earth. But he sees some real opportunities. Curiosity can also bake crushed soil and rock up to 1,800 degrees Fahrenheit (982 degrees Celsius), potentially freeing organics not released by Viking’s less advanced ovens. Equally important, SAM can analyze crushed and gasified minerals that are known to form only in water and could preserve organics. What’s the likelihood of finding organics? 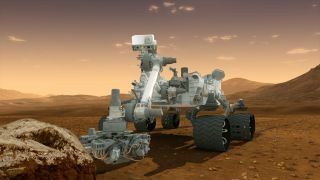 John Grunsfeld, head of NASA’s Science Mission Directorate, said he likes Curiosity’s chances. "If I had to predict the future, I would say it’s likely. But we’ll find out soon enough." His conclusion is grounded in what we have learned about Mars in recent years. Specifically, a paper in May by the Carnegie Institute’s Andrew Steele and colleagues found clear evidence of organic material in meteorites found on Earth but originating from Mars. It’s conceivable that the organics somehow entered the meteorites as they flew through space on their way to Earth, but Steele concluded the organics were definitely not the result of terrestrial contamination and so possibly were from Mars. Add to this discovery the deepening understanding of how widespread extraterrestrial organics of all kinds are in space, and the case for complex carbon compounds on Mars gets stronger. Yet the one time that NASA specifically tested for organics on Mars was in the 1970s with the two Viking landers, and the results were interpreted then as negative. These disappointing and unexpected results were a major reason why efforts to search for life on Mars were discontinued and not resumed until the Curiosity mission. The Viking missions returned confusing results, but a new hypothesis about microbes that live in presence of hydrogen peroxide provides a possible explanation. Now, however, a scientific argument is raging about whether that Viking conclusion of "no organics" was accurate, just as there has been a long-running debate about whether one of the Viking instruments might have actually found Martian life. The evolving organics debate illustrates how each successive mission adds potentially invaluable information about past findings, and consequently how successive exploration efforts build on the past. The instrument used by Viking to search for organics was a gas chromatograph-mass spectrometer, and the principal investigator was MIT’s Klaus Biemann. The instrument heated Martian soil samples to as high as 930 degrees Fahrenheit (500 degrees Celsius) and then analyzed the elements and compounds released with the spectrometer. At the time, it was reported that small amounts of chloromethane and dichloromethane were released at 390 degrees F (200 degrees C) and above 660 degrees F (350 degrees C) respectively, but these organic compounds were described as earthly contaminants, probably from cleaning products. Two men who are co-investigators on the SAM instrument have been challenging the "no organics" conclusion for some time, and say that Curiosity has the capability to transform or even end the debate. Chris McKay, an astrobiologist at NASA’s Ames Research Center and Rafael Navarro-Gonzalez of the Universidad Nacional Autónoma de México have worked in Chile’s barren Atacama Desert and Antarctica for years, and have found organic material (and microbes) everywhere they’ve looked. More recently, however, McKay and Navarro-Gonzalez have raised an intriguing alternative hypothesis, this one based on a surprising discovery made during the Mars Phoenix mission. That lander near the northern Arctic region of Mars discovered not only water ice just below the surface but also the compound perchlorate — a salt that has caustic qualities but which also can serve as a kind of anti-freeze. Perchlorates are found on Earth in some extreme desert and polar areas as well, and McKay and Navarro-Gonzalez decided to test what happened when it was added to Atacama soil and put through the kind of heating done in the Viking GC-MS.
What they found led to a eureka moment of sorts: two of the trace byproducts were chloromethane and dichloromethane, the organic compounds found by Viking and written off as contaminants. Not only that, but any sign of Atacama organics had disappeared, seemingly destroyed in the presence of the perchlorate. "Before Phoenix, perchlorate hadn’t entered my world view," McKay said. "Now it’s the most interesting molecule in the universe to me." And as luck would have it, the SAM instrument has a limited but otherwise ideal set of tools for testing whether perchlorates are masking the organics on Mars. In addition to its dozens of chambers to take in crushed Martian soil and rock for high-temperature baking, Curiosity also has nine cups filled with a liquid that can be used to extract organics for analysis through pyrolysis. The nine were not added to SAM with the perchlorate question in mind, but the solvent cups are ideal for that analysis, McKay said, and he expects some of them to be used for that purpose. "If Mars is similar to the Atacama like we think it is, then there should be gobs of organics hidden by the perchlorate," McKay said. "We think we’ll be able to see through the perchlorate this time to those organics." Klaus Biemann, leader for the Viking GC-MS experiment, has sharply criticized the perchlorate theory. In a published comment on the Navarro-Gonzalez and McKay paper, he and Jeffrey Bada of the Scripps Institution wrote that the theory is based on faulty data and unfounded extrapolations, and that it ignores the known presence of several cleaning compounds found in the GC-MS during the Viking experiments. They also contend that if the process described by McKay and Navarro-Gonzalez had taken place, that other compounds — in this case other chlorinated aromatic molecules — would also be produced on Mars, yet they were not. Biemann and Bada agree that meteorites with organic carbon do indeed fall continuously onto Mars, as they do throughout the galaxy. But they argue that the organics are destroyed by high-energy radiation, which in turn leads to a build-up of equally destructive oxidizing agents. Biemann says that the GC-MS instrument used by Curiosity is, in some ways, an advance over the ones on the Viking landers. That’s why, he said, if Curiosity is not able to detect organics, then it becomes ever more apparent that those compounds can’t survive on the Martian surface. "It’s end of story," he said. The Mars organics search has numerous other targets, including the gas methane which some think is central to understanding the possibilities for life on Mars. In 2009, NASA’s Michael Mumma and Geranimo Villaneuva published a long-anticipated article about the release of large plumes of methane at certain locations and at defined times. Methane is formed overwhelmingly through biology on Earth, and so its presence on Mars could also be coming from biological sources. The Sample Analysis at Mars (SAM) instrument for NASA's Mars Science Laboratory mission will study chemistry of rocks, soil and air as the mission's rover, Curiosity, investigates Gale Crater on Mars. SAM was built at the NASA Goddard Space Flight Center, Greenbelt, Md., where this image was taken. Using a Tunable Laser Spectrometer (TLS) on SAM, Curiosity will search for methane in the atmosphere and, if found, will be able to determine the carbon-12 to carbon-13 isotopic ratio in the gas. The results of that measurement would not say conclusively whether the methane had a biological or abiotic origin, but it would definitely move the debate further. It’s not an ideal approach to tracking Mars methane because, according to Mumma, the gas disappears quite quickly in the atmosphere, and so it would be mostly likely found close to the area where the eruptions occur. Gale Crater is not one such area, but could be close enough to have some methane in the air. The TLS will analyze the carbon-12 to carbon-13 ratios of organics that might be found, and could provide some of the most significant information SAM will deliver. That’s because carbon-12 is used and produced by living things, while carbon-13 is not. “If we find high ratios of carbon-12, then that strongly suggests life was involved," said James Green, director of NASA’s planetary science division. "That finding would be very telling and important." SAM leader Mahaffy has been living and breathing the hunt for organics on Mars for years now. He is involved with the tiniest details, but that’s all in the service of understanding the big picture. "Life emerged billions of years ago on Earth, and a fundamental question that remains is, 'Did life also emerge on Mars at that time, and if not, why not?'" he said. Marc Kaufman is a science and space reporter for the Washington Post, and author of "First Contact: Scientific Breakthroughs in the Hunt for Life Beyond Earth." His newest book, published by National Geographic, is "Mars Landing 2012: Inside NASA’s Curiosity Mission."